Wrong. Wrong. WRONG. Did we happen to mention it was WRONG……?? We’ll be honest with you. 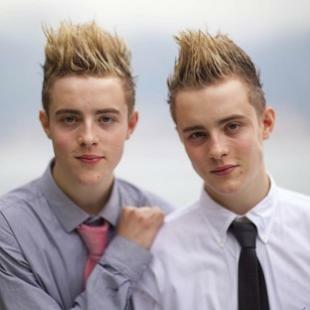 When we watched The X Factor in 2009 we thought we’d got Jedward sussed – basically a couple of identical twin talent vacuums with silly hair whose career would doubtless last for as long as the novelty of all those routines they performed on the show. At which point they would retire, aged 21, absolutely loaded and spend the rest of their lives pointlessly frittering away their endless amounts of disposable income. It appears however we were wrong. Not content with foisting their ridiculous album on the world, duetting with Vanilla Ice, advertising Nintendo, appearing on Big Brother 11 and generally hanging around like a bad smell, the act more commonly known as John and Edward Grimes now have Eurovision in their sights. The pair have announced their intention to bid for the Irish ticket to Dusseldorf, and are set to perform their potential entry – the title of which has yet to be confirmed – on The Late Late Show on February 11. And despite being up against some stiff competition – including Niamh Kavanagh’s backing vocalist cousin Nikki – they’re tipped to win. We’re actually not quite sure how to take this news, quite frankly. On the one hand it sounds like a stroke of genius, on the other hand we’re not entirely sure that anybody outside of the UK (who doubtless would reward the Irish teenagers with a boatload of points) has actually heard of them and would understand the post-modern irony of their performance. At the very least, it would make for interesting viewing – although the backstage staff, in view of their wacky personalities and the way they rampaged through the Big Brother house prodding random people last summer, might want to consider nailing everything down before they make it into the green room. Oh, and in case you live in Lithuania or somewhere and have absolutely NO idea who we’re talking about, here is one of the reasons why they went down in X Factor history….. This entry was posted on January 14, 2011 at 7:32 pm	and is filed under Eurovision 2011, Ireland. You can follow any responses to this entry through the RSS 2.0 feed. You can leave a response, or trackback from your own site. These guys are really fun. However their voice didn’t sound to nice for my ears.